Please visit the Dogs NZ web site for contact details for this judge. NZKC All BREEDS JUDGE..& JDH. I have been involved with dogs all my life. Have shown/handled,bred & owned several breeds. Including Bedlington Terriers, Airedale Terriers. Boston Terriers. Pomeranian & Whippet. 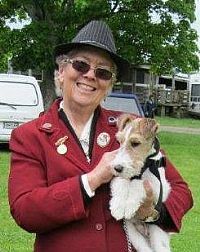 I am owned by Fox Terriers Wire & smooth & Norwich Trs. co-owner with my daughter Am Cocker Spaniels. Life member of Huntly & Districts K.A. Chair Region 2 of the NZDJA. On the National board of NZDJA.